International teams of astronomers are now busy working on new and exciting data obtained during the last week with telescopes at the European Southern Observatory (ESO). Their object of study is the remnant of a mysterious cosmic explosion far out in space, first detected as a gigantic outburst of gamma rays on May 10. Gamma-Ray Bursters (GRBs) are brief flashes of very energetic radiation - they represent by far the most powerful type of explosion known in the Universe and their afterglow in optical light can be 10 million times brighter than the brightest supernovae . The May 10 event ranks among the brightest one hundred of the over 2500 GRB's detected in the last decade. The new observations include detailed images and spectra from the VLT 8.2-m ANTU (UT1) telescope at Paranal, obtained at short notice during a special Target of Opportunity programme. This happened just over one month after that powerful telescope entered into regular service and demonstrates its great potential for exciting science. In particular, in an observational first, the VLT measured linear polarization of the light from the optical counterpart, indicating for the first time that synchrotron radiation is involved . It also determined a staggering distance of more than 7,000 million light-years to this GRB . The astronomers are optimistic that the extensive observations will help them to better understand the true nature of such a dramatic event and thus to bring them nearer to the solution of one of the greatest riddles of modern astrophysics. The present story is about important new results at the front-line of current research. At the same time, it is also a fine illustration of a successful collaboration among several international teams of astronomers and the very effective way modern science functions. It began on May 10, at 08:49 hrs Universal Time (UT), when the Burst And Transient Source Experiment (BATSE) onboard NASA's Compton Gamma-Ray Observatory (CGRO) high in orbit around the Earth, suddenly registered an intense burst of gamma-ray radiation from a direction less than 10° from the celestial south pole. Independently, the Gamma-Ray Burst Monitor (GRBM) on board the Italian-Dutch BeppoSAX satellite also detected the event (see GCN GRB Observation Report 304 ). Following the BATSE alert, the BeppoSAX Wide-Field Cameras (WFC) quickly localized the sky position of the burst within a circle of 3 arcmin radius in the southern constellation Chamaeleon. It was also detected by other satellites, including the ESA/NASA Ulysses spacecraft, since some years in a wide orbit around the Sun. 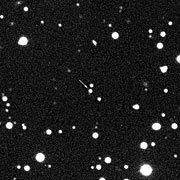 The event was designated GRB 990510 and the measured position was immediately distributed by BeppoSAX Mission Scientist Luigi Piro to a network of astronomers. It was also published on Circular No. 7160 of the International Astronomical Union (IAU). From Amsterdam (The Netherlands), Paul Vreeswijk, Titus Galama , and Evert Rol of the Amsterdam/Huntsville GRB follow-up team (led by Jan van Paradijs ) immediately contacted astronomers at the 1-meter telescope of the South African Astronomical Observatory (SAAO) (Sutherland, South Africa) of the PLANET network microlensing team, an international network led by Penny Sackett in Groningen (The Netherlands). There, John Menzies of SAAO and Karen Pollard (University of Canterbury, New Zealand) were about to begin the last of their 14 nights of observations, part of a continuous world-wide monitoring program looking for evidence of planets around other stars. Other PLANET sites in Australia and Tasmania where it was still nighttime were unfortunately clouded out (some observations were in fact made that night at the Mount Stromlo observatory in Australia, but they were only announced one day later). 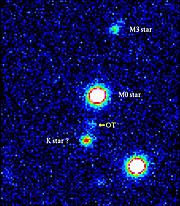 As soon as possible - immediately after sundown and less than 9 hours after the initial burst was recorded - the PLANET observers turned their telescope and quickly obtained a series of CCD images in visual light of the sky region where the gamma-ray burst was detected, then shipped them off electronically to their Dutch colleagues . Comparing the new photos with earlier ones in the digital sky archive, Vreeswijk, Galama and Rol almost immediately discovered a new, relatively bright visual source in the region of the gamma-ray burst, which they proposed as the optical counterpart of the burst, cf. their dedicated webpage at http://www.astro.uva.nl/~titus/grb990510/. The team then placed a message on the international Gamma-Ray Burster web-noteboard (GCN Circular 310), thereby alerting their colleagues all over the world. One hour later, the narrow-field instruments on BeppoSax identified a new X-Ray source at the same location (GCN Circular 311), thus confirming the optical identification. All in all, a remarkable synergy of human and satellite resources! Vreeswijk, Galama and Rol, in collaboration with Nicola Masetti, Eliana Palazzi and Elena Pian of the BeppoSAX GRB optical follow-up team (led by Filippo Frontera ) and the Huntsville optical follow-up team (led by Chryssa Kouveliotou ), also contacted the European Southern Observatory (ESO). Astronomers at this Organization's observatories in Chile were quick to exploit this opportunity and crucial data were soon obtained with several of the main telescopes at La Silla and Paranal, less than 14 hours after the first detection of this event by the satellite. The data from Chile were sent to Europe where, by quick comparison of images from the Wide-Field Imager (WFI) at the MPG/ESO 2.2-m telescope at La Silla with those from SAAO, the Dutch and Italian astronomers found that the brightness of the suspected optical counterpart was fading rapidly; this was a clear sign that the identification was correct (GCN Circular 313). With the precise sky position of GRB 990510 now available, the ESO observers at the VLT were informed and, setting other programmes aside under the Target of Opportunity scheme, were then able to obtain polarimetric data as well as a very detailed spectrum of the optical counterpart. Comprehensive early observations of this object were also made at La Silla with the ESO 3.6-m telescope (CCD images in the UBVRI-bands from the ultraviolet to the near-infrared part of the spectrum) and the ESO 3.6-m New Technology Telescope (with the SOFI multimode instrument in the infrared JHK-bands). 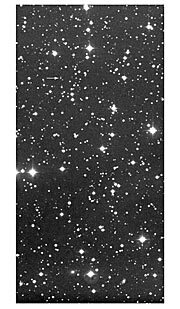 A series of optical images in the BVRI-bands was secured with the Danish 1.5-m telescope, documenting the rapid fading of the object. Observations at longer wavelengths were made with the 15-m Swedish-ESO Submillimetre Telescope (SEST). All of the involved astronomers concur that a fantastic amount of observations has been obtained. They are still busy analyzing the data, and are confident that much will be learned from this particular burst. A group of Italian astronomers led by Stefano Covino of the Observatory of Brera in Milan, have observed for the first time polarization (some degree of alignment of the electric fields of emitted photons) from the optical afterglow of a gamma-ray burst, see their dedicated webpage at http://www.merate.mi.astro.it/~lazzati/GRB990510/. This yielded a polarization at a level of 1.7 ± 0.2 percent for the optical afterglow of GRB 990510, some 18 hours after the gamma-ray burst event; the magnitude was R = 19.1 at the time of this VLT observation. Independently, the Dutch astronomers Vreeswijk, Galama and Rol measured polarization of the order of 2 percent with another data set from the VLT ANTU and FORS1 obtained during the same night. This important result was made possible by the very large light-gathering power of the 8.2-m VLT-ANTU mirror and the FORS1 imaging polarimeter. 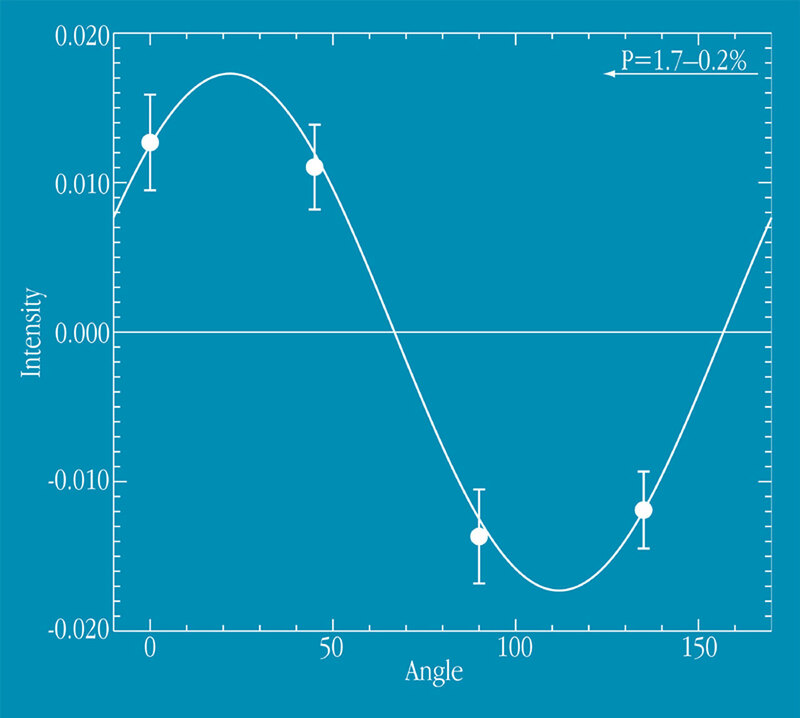 Albeit small, the detected degree of polarization is highly significant; it is also one of the most precise measurements of polarization ever made in an object as faint as this one. Most importantly, it provides the strongest evidence to date that the afterglow radiation of gamma-ray bursts is, at least in part, produced by the synchrotron process , i.e. by relativistic electrons spiralling in a magnetized region. This type of process is able to imprint some linear polarization on the produced radiation, if the magnetic field is not completely chaotic. 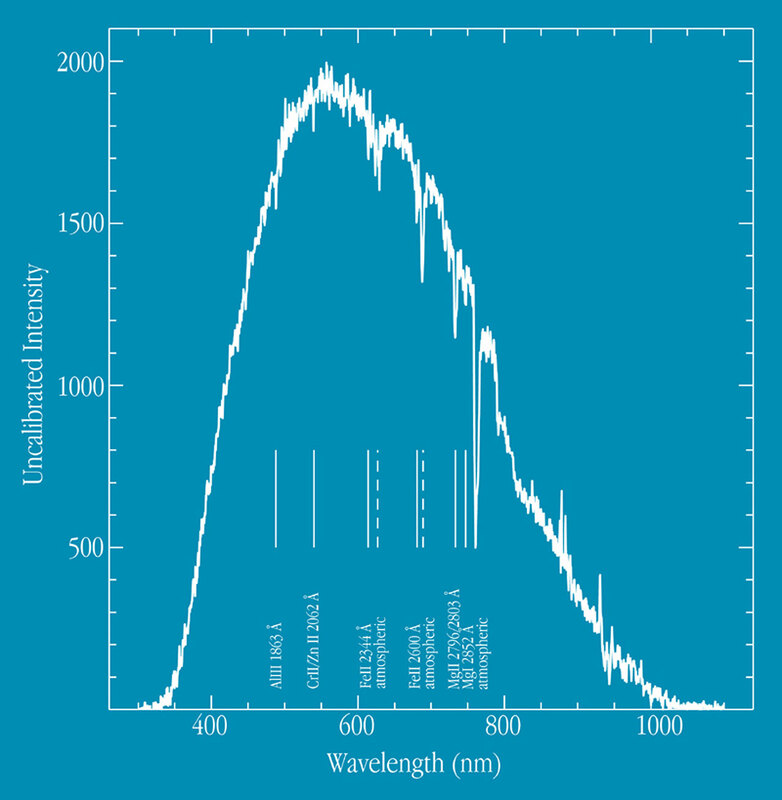 A VLT spectrum with the multi-mode FORS1 instrument was obtained a little later and showed a number of absorption lines , e.g. from ionized Aluminium, Chromium and neutral Magnesium. They do not arise in the optical counterpart itself - the gas there is so hot and turbulent that any spectral lines will be extremely broad and hence extremely difficult to identify - but from interstellar gas in a galaxy 'hosting' the GRB source, or from intergalactic clouds along the line of sight. It is possible to measure the distance to this intervening material from the redshift of the lines; astronomers Vreeswijk, Galama and Rol found z = 1.619 ± 0.002 . This allows to establish a lower limit for the distance of the explosion and also its total power. The numbers turn out to be truly enormous. The burst occurred at an epoch corresponding to about one half of the present age of the Universe (at a distance of about 7,000 million light-years ), and the total energy of the explosion in gamma-rays must be higher than 1.4 10 53 erg , assuming a spherical emission. This energy corresponds to the entire optical energy emitted by the Milky Way in more than 30 years; yet the gamma-ray burst took less than 100 seconds. Since the optical afterglows of gamma-ray bursts are faint, and their flux decays quite rapidly in time, the combination of large telescopes and fast response through suitable observing programs are crucial and, as demonstrated here, ESO's VLT is ideally suited to this goal! Combining results from a multitude of telescopes has provided most useful information. 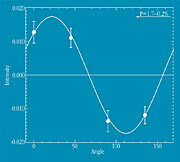 Interestingly, a "break" was observed in the light curve (the way the light of the optical counterpart fades) of the afterglow. 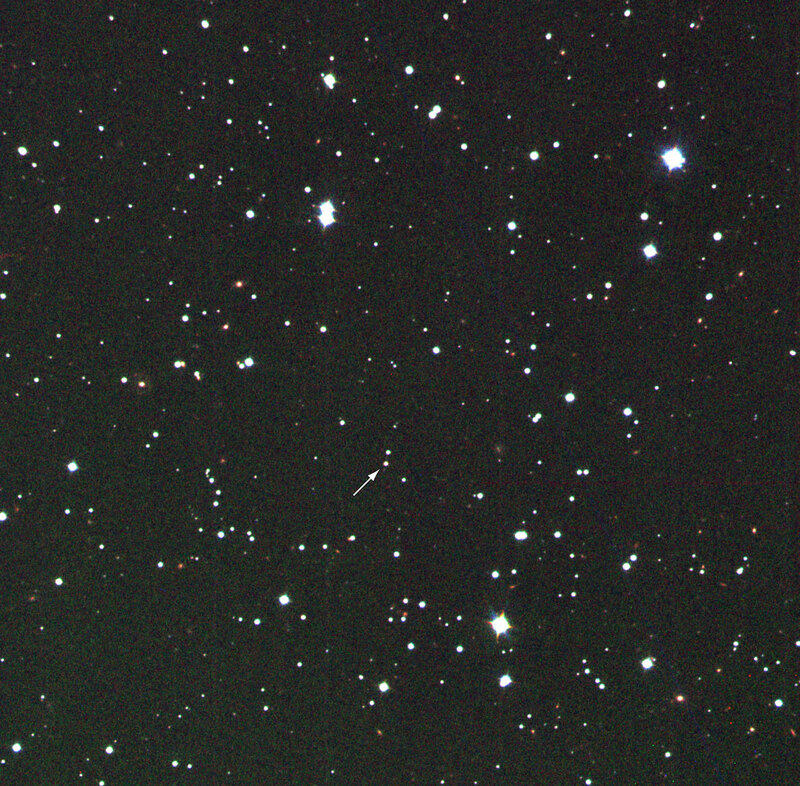 Some 1.5 - 2 days after the explosion, the brightness began to decrease more rapidly; this is well documented with the CCD images from the Danish 1.5-m telescope at La Silla and the corresponding diagrams are available on a dedicated webpage at http://www.astro.ku.dk/~jens/grb990510/ at the Copenhagen University Observatory. Complete, regularly updated lightcurves with all published measurements, also from other observatories, may be found at another webpage in Milan at http://www.merate.mi.astro.it/~gabriele/990510/ . This may happen if the explosion emits radiation in a beam which is pointed towards the Earth. Such beams are predicted by some models for the production of gamma-ray bursts. They are also favoured by many astronomers, because they can overcome the fundamental problem that gamma-ray bursts simply produce too much energy. If the energy is not emitted equally in all directions ("isotropically"), but rather in a preferred one along a beam, less energy is needed to produce the observed phenomenon. Such a break has been observed before, but this time it occurred at a very favourable moment, when the source was still relatively bright so that high-quality spectroscopic and multi-colour information could be obtained with the ESO telescopes. Together, these observations may provide an answer to the question whether beams exist in gamma-ray bursts and thus further help us to understand the as yet unknown cause of these mysterious explosions. 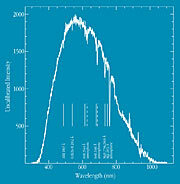 Further photometric and spectroscopic observations with the ESO VLT, performed by Klaus Beuermann, Frederic Hessman and Klaus Reinsch of the Göttingen group of the FORS instrument team (Germany), have revealed the character of some of the objects that are seen close to the image of the afterglow of GRB 990510 (also referred to as the "Optical Transient" - OT). Two objects to the North are cool foreground stars of spectral types dM0 and about dM3, respectively; they are located in our Milky Way Galaxy. The object just to the South of the OT is probably also a star. 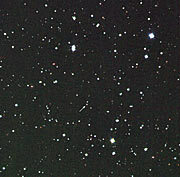 A V(isual)-band image (ESO Press Photo eso9926) taken during the night between May 17 and 18 with the VLT/ANTU telescope and FORS1 now shows the OT at magnitude V = 24.5, with still no evidence for the host galaxy that is expected to appear when the afterglow has faded sufficiently. The great distances (high redshifts) of Gamma-Ray Bursts, plus the fact that a 9th magnitude optical flash was seen when another GRB exploded on January 23 this year, has attracted the attention of astronomers outside the GRB field. In fact, GRBs may soon become a very powerful tool to probe the early universe by guiding us to regions of very early star formation and the (proto)-galaxies and (proto)-clusters of which they are part. They will also allow the study of the chemical composition of absorbing clouds at very large distances. At the end of this year, the NASA satellite HETE-II will be launched, which is expected to provide about 50 GRB alerts per year and, most importantly, accurate localisations in the sky that will allow very fast follow-up observations, while the optical counterparts are still quite bright. It will then be possible to obtain more spectra, also of extremely distant bursts, and many new distance determinations can be made, revealing the distribution of intrinsic brightness of GRB's (the "luminosity function"). Other types of observations (e.g. polarimetry, as above) will also profit, leading to a progressive refinement of the available data. Thus there is good hope that astronomers will soon come closer to identifying the progenitors of these enormous explosions and to understand what is really going on. In this process, the huge light-collecting power of the VLT and the many other facilities at the ESO observatories will undoubtedly play an important role. Gamma-Ray Bursts are brief flashes of high-energy radiation. Satellites in orbit around the Earth and spacecraft in interplanetary orbits have detected several thousand such events since they were first discovered in the late 1960s. Earlier investigations established that they were so evenly distributed in the sky that they must be very distant (and hence very powerful) outbursts of some kind. Only in 1997 it became possible to observe the fading "afterglow" of one of these explosions in visible light, thanks to accurate positions available from the BeppoSAX satellite. 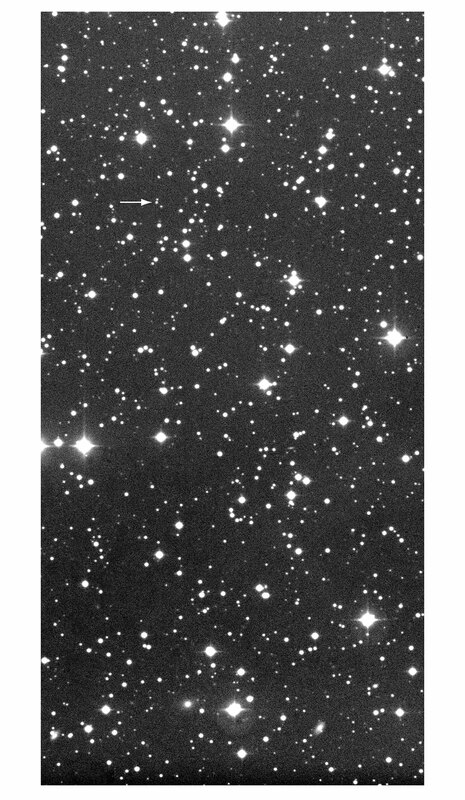 Soon thereafter, another optical afterglow was detected; it was located in a faint galaxy whose distance could be measured. In 1998, a gamma-ray burst was detected in a galaxy over 8,300 million light-years away. Even the most exotic ideas proposed for these explosions, e.g. supergiant stars collapsing to black holes, black holes merging with neutron stars or other black holes, and other weird and wonderful notions have trouble accounting for explosions with the power of 10,000 million million suns. The various reports issued by astronomers working on this and other gamma-ray burst events are available as GCN Circulars on the GRB Coordinates Network web-noteboard. See also the Press Release, issued by SAAO on this occasion. In astronomy, the redshift (z) denotes the fraction by which the lines in the spectrum of an object are shifted towards longer wavelengths. The observed redshift of a distant galaxy or intergalactic cloud gives a direct estimate of the universal expansion (i.e. the "recession velocity"). The detailed relation between redshift and distance depends on such quantities as the Hubble Constant, the average density of the universe, and the 'cosmological' Constant. For a standard cosmological model, redshift z = 1.6 corresponds to a distance of about 7,000 million light-years. Assuming a Hubble Constant H 0 = 70 km/s/Mpc, mean density Omega 0 = 0.3 and a Cosmological Constant Lambda = 0.